Given that Major League Soccer may not start the season, one of its biggest stars could leave to play in England again. The details have yet to be worked out, as it has not come to that point yet, but if the players in MLS strike, Landon Donovan could return to play with Everton, where he was recently on loan for ten weeks. In a press conference in Los Angeles today, Donovan spoke with fondness of his time at the Merseyside club. "It was a little bittersweet to leave, but the reality was that the agreement all along was for me to be there until March 15," Donovan said. "Obviously, you get caught up in what is going on and it's fun and exciting to be a part of what I was just a part of . You can't mirror that in any way, you can't duplicate that, but the reality is that I'm very excited to be home. If fate comes around again and I'm meant to go back there, then I'll go back there." Donovan wasn't just alluding to the possibility of going on loan to Everton again. When asked directly if a players' strike in MLS could see him return to the English club, Donovan indicated that there was a chance that would happen. March 25th is the deadline date for MLS players to either sign a deal or declare a strike. "There's nothing concrete set up," Donovan acknowledged. "I think we've all been clear about the possiblity that I could go back if something happens. It's kind of, "We'll cross that bridge when we get to it." Right now, everyone on this side of the pond is still hopeful that we can still get a deal done." However, on the other side of the pond, some Evertonians who viewed DOnovan's loan period as successful, may be rooting for the MLS players to strike, if that would bring their American player back more quickly. The loan period also did Donovan some good, according to the player himself. "The ability to succced there week after week, playing against some of the biggest players in the world and succeeding gives you a lot of confidence," Donovan said. "I'm not going to technically become a better player - at 28. But probably tactically, I learned, and some things about myself, on and off the field and I think it'll help me a lot." 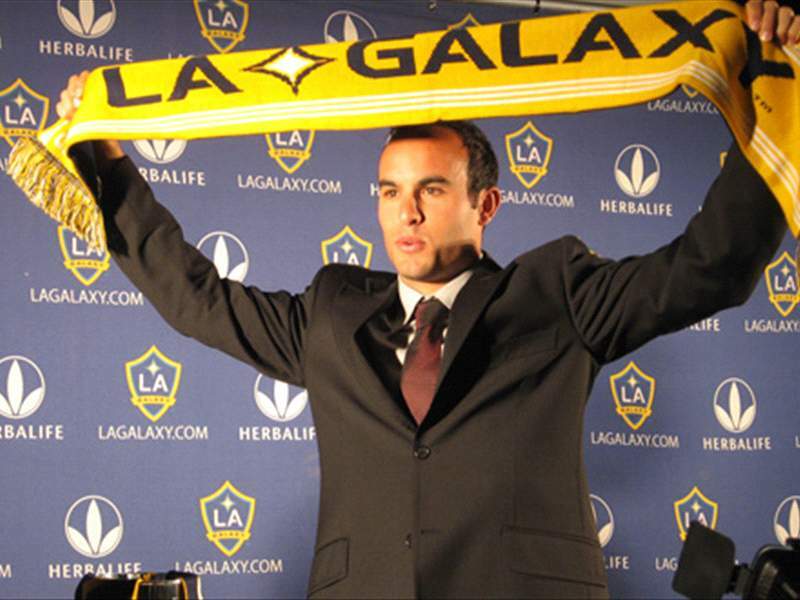 During his time in England, Donovan still kept up with his club in Los Angeles, mostly through conversations with his Galaxy coach, Bruce Arena. "I spoke to Bruce a lot, probably once a week at least while I was there," Donovan said. "It's nice to keep updated." Already the Galaxy captain has participated in training sessions, including a scrimmage versus Hollywood United. "I played the first half of the scrimmage with our three new Brazilians and the second half with Mickey Stevens and it honestly felt like they've been part of our team for a long time," Donovan said in assessing the Galaxy's new players. "It is very easy to fit in when you have a nucleus like we do." Yet Donovan also praised the team spirit at Everton. "I could feel that this was a real team, everyone cared about the team. There was no individual, no ego that overshadowed the team. When you feel that way, it makes you better as a player. You want to fit into that." Become a fan of Goal.com USA's Facebook fan page for all the latest news and insight into everything the related to the beautiful game.